Pages is Apple’s latest take on the word processor, a product line that started with MacWrite on the very first Macs. 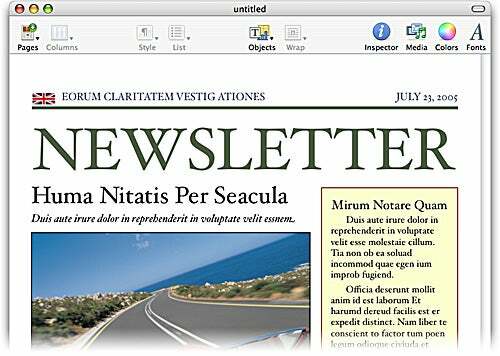 Most recently, AppleWorks was carrying the word-processing flag for Apple, but it was starting to show its age—it was written well before OS X came along, and as such, it took advantage of very little of what OS X has to offer. Enter Pages, the word processing package in the iWorks ’05 suite. 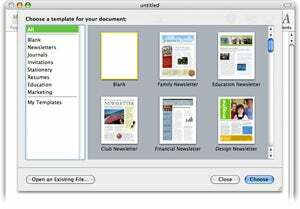 Pages was written from the ground up for OS X. Pages might best be described as a word processor with page-layout skills, or a page-layout program with word processing skills. It does quite a bit of both, and yet isn’t completely one or the other. While that may sound confusing, what it means is that you get a good word processor that also happens to create great looking page layouts. 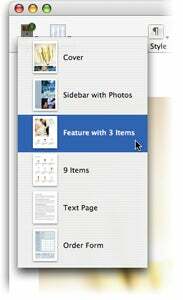 The same team that developed Pages also worked on Keynote 2, the presentation application included in iWork. And if you’ve spent any time with Keynote—which we’ve already previewed —you’ll recognize that fact as soon as you launch Pages. At launch, Pages looks a lot like Keynote: pick a theme that you’d like to use for your document, and then work from that starting point to build the final product. As you’ll soon see, there are other features that Pages shares with Keynote… and a key feature that you’ll wish Pages had also borrowed! You’re an advanced user who relies on macros to automate your word processing tasks. If Pages can’t do any of these things, then just who might want to use it? Just about everyone, I’m guessing, since it makes the creation of professional-looking documents a relatively trivial process. But everything on the page, including the images, is merely a placeholder—click on the NEWSLETTER heading, for instance, and it highlights. Whatever you type next becomes the headline. 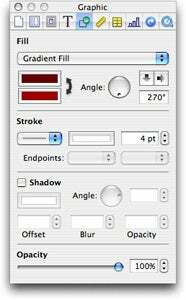 Want to replace a graphic? Drag a replacement picture from the Finder or the Media window (more on that later) onto a current graphic, and drop. The new picture replaces the old. As you replace text and graphics, the page layout changes subtly, reflowing text around new graphics, moving chunks of text to accommodate longer words, and more. Everything on the page works in this same manner—headers, footers, text areas, and images all contain filler that you replace with your own content. Very quickly, you’ll turn the generic template page into something of your own creation. Adding another page to your document is as simple as clicking on the Pages icon in the toolbar. When you do, you’ll most likely see a drop-down menu listing additional page designs. (Not every theme has more than one design.) Choose one, and it’s inserted below the current page in your document. For example, this screenshot shows a new “Feature with 3 Items” page being added to the existing document, which was created using the Catalog theme. Notice that all the other pages are all things you might want in a catalog, from a multiple-item page to a convenient order form. By using the templates, replacing text and graphics as you go, adding new pages when needed, you can very quickly build a professional-looking final document in minutes instead of hours. Just like Keynote, Pages uses a floating Inspector window for making changes to the text and objects in your document. This screenshot shows the Inspector with the Graphics panel active; you can use the panel to control all aspects of a placed graphic’s appearance. The other panels of the Inspector handle things such as overall document information, text wrapping properties of placed graphics, text formatting, tables and charts, hyperlinks, and rulers and tabs. Multiple Inspectors You may not know it, but in Pages (and Keynote), you can have more than one inspector onscreen at a time. Just use View: New Inspector, and you’ll get a second (or third or fourth…) floating palette. This can be very useful, for example, if you’re working with a graphic—open one Inspector to the Graphic tab, and another to the Wrapping tab. Or open an Inspector and set it to show the Info section of the Document tab, and you’ve got a live-updating window showing total words, pages, number of graphics, total characters, and more. By using the various Inspector options, you can really make what started as a standardized template into something that looks very different while retaining the benefits of the overall design of the template. When you’re done tweaking your template, you can even save it as your own customized design. Just choose File: Save as Template, and your custom design will show up in the Pages theme picker the next time you open a new document. Workaround a Bug in Find and Replace The Find and Replace panel in Pages suffers from a bug in Cocoa (the language Pages was written in). If you open the Find and Replace panel (press Command-F) and then enter words in both the Find and Replace boxes, and click Replace and Find, Pages will insert the “replace” word at the current cursor position. In addition, if you press this button after the last “find” word has been replaced, your replace word will be inserted over and over, each time you click the button. The solution? Hitting Next before using the Find and Replace button the first time will take care of the first glitch. For the second, though, you’ll probably only notice it when you see your replace word added for a second time, so just keep your eyes on the document window! Keynote’s new Media Browser window has also been incorporated into Pages. The Media Browser makes it simple to include photos, music, and movies in your Pages document. While direct access to iPhoto’s photo collection is definitely a plus, the benefits of placing movies and music in a Pages document are much less clear. Pages can only export to generally “static” formats: PDF, Word, HTML, RTF, and Plain Text. Audio and video support in these formats range from non-existent to fair, but none do a good job with embedded audio and video objects from Pages. In general, if you want to work with audio and video, you should probably be using Keynote, not Pages. Placing Images When placing images into a Pages document, they are placed based on what you drag them into. While dragging the image, a blue border will highlight the “destination object” that will receive the dropped image. If you drop onto an existing image, it will be replaced with the new image. If you drop into a table cell, the image will be shrunk to fit into the available size of the cell. If you drop into a text field, the image will be placed within that field in what’s called “inline mode.” Inline images move as the text around them moves. The other option is “fixed mode,” in which the image’s position on the page never changes even as text is added and deleted. Deleting Images from Table Cells Images dropped into table cells are treated differently than images dropped into other locations. It seems they lose their “object” status when dropped, and are instead converted into a background “fill” for that cell. As such, you can’t just click the image to select and delete (or move) it. Instead, you need to use the Graphic tab of the Inspector, and set the Fill pop-up to None. When you do this, the image vanishes. If you just wanted to move it elsewhere, you’ll first have to re-add the image.